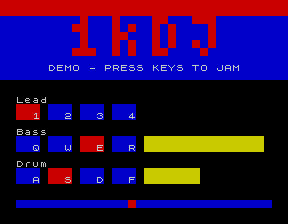 1kdj is a little demo that I’ve been working on just for fun. It started when I was trying to make a 1k intro for Forever 9 in March. That intro was to have some funky music combined with a simple wireframe 3D effect. I had my code pretty much finished with a week to go before the party when I deciding that, actually, it just wasn’t very good. So I binned it. But I had enjoyed working on it so much that I decided to start on something else just a week or so later. I’ve always enjoyed squeezing music into my 1k intros but they are always a bit limited because you have to get some effect code in there too, so this time I thought I’d write a pure music player. But, hey, that would be too boring and too easy so I ended up going for an interactive music player – a DJ program in 1k. This entry was posted in atebit, Computers, Demoscene, Development, Music. Bookmark the permalink.